Optus’ latest venture dives deep to promise safer beaches with world-first shark detection technology. 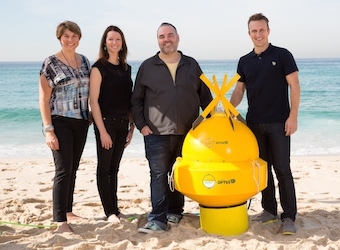 Optus has worked with technology company Shark Mitigation Services, Google and ad agency M&C Saatchi to create a buoy that detects sharks and alerts beach-goers in real time, using a combination of Google Plus technology and the Optus Network. The ‘Clever Buoy’ uses sonar to detect ‘shark sized objects’ and sends signals to lifeguards who can then warn beach-goers and minimise the risk of shark attacks. Unlike shark nets, the buoy is non-invasive to sharks and marine life. Ad agency M&C Saatchi was responsible for the campaign surrounding the buoy, creating videos and an interactive website. “We didn’t want just an advertising campaign,” Nathan Rosenberg, Optus head of brand, said in a statement. Google has added the ‘Clever Buoy’ to its global Re:Brief project, the first Australian project in the company’s experimental advertising portfolio. The product is still in its prototype phase but developers hope to make it commercially ready by mid 2015. Producers are now working on building the buoy’s capacity to recognise various shark species, behaviour and improve the detection range. “This project…[is] a demonstration of [Optus’] DNA, to push the boundaries of innovation and have their consumers’ backs,” the company said in a statement.